After the politician, if one were to pick a profession that was as scorned, it would have to be that of the TV journalist. Ram Gopal Varma is itching to tell a new story in his movies. Amitabh Bachchan, this man has done it before and again he does it with tremendous ease. By his sheer simplicity of getting into the skin of the character makes an average film worth watching. 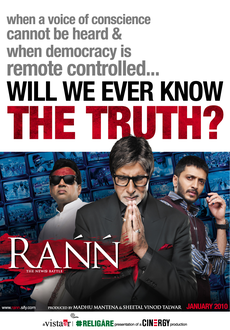 Ram Gopal Varma and Amitabh Bachchan went on a tirade declaring that Rann would give you a peephole look into the cable-clogged running of a news channel. It is for the intelligentsia, and they are the ones who will truly be able to appreciate the movie for what it truly is – a movie with its heart in the right place. The Next Time You Watch News, Think About It!